One day during work, I ran out to a small sandwich shop nearby to pick up a very late lunch. By the time I got there, the only vegan items that were left were eggplant slices and hummus, as the shop had already begun to disassemble everything from the lunch rush. 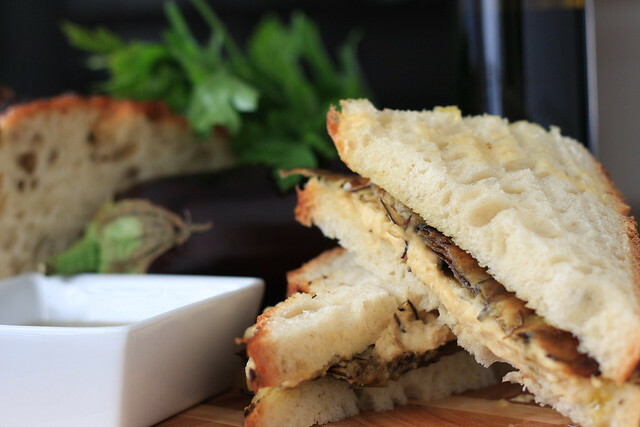 However, this unlikely combo of rich, tahini-heavy hummus and crispy roasted eggplant tasted amazing together and, next to the tempeh reuben, is now one of my favorite sandwiches. Rinse the eggplant and slice off both ends, then slice the eggplant in half, lengthwise. Using a mandoline slicer, slice both pieces of the eggplant into thin strips. Place on a greased, foil-lined baking sheet in a single llayer. Drizzle a bit of olive oil over the top and sprinkle with salt and pepper. Bake for about 25 minutes, checking it after 15 minutes. Make the hummus by blending the next five ingredients in a small food processor. Set aside. The eggplant is ready when it is nicely browned and crispy. Remove it immediately from the baking sheet or it will stick. Assemble the sandwiches with the eggplant and hummus and serve with a side a balsamic viniagrette. I had never though of mixing hummus and eggplant. It's a great idea. Looks like a delicious sandwich…!